We use pressure variations to produce piezoelectric energy. This project was created on 07/16/2018 and last updated 9 months ago. When we thought of an ambient energy source many of the common methods skimmed through us. But we were a bit conscious to avoid the conventional and common energy sources and finally arrived at two uncommon ambient energy sources. They where Peltier energy and Piezoelectric energy. Both are not much common and of which we opt Piezoelectric energy as our topic for research. What is piezoelctricity ? Piezoelectric Effect is the ability of certain materials to generate an electric charge in response to applied mechanical stress or in more detail piezoelectricity, also called the piezoelectric effect, is the ability of certain materials to generate an AC (alternating current) voltage when subjected to mechanical stress or vibration, or to vibrate when subjected to an AC voltage, or both. In our case we only use ability of certain materials to generate an AC voltage. There are a number of applications of piezoelectricty and various methods of harvesting piezoelectricity. But we were cautious not to repeat any of conventional harvesting methods. When we looked around we saw various of methods but of we found this most efficient. We are assembling piezoelectric elements on the wheel of a vehicle. When the vehicle moves one of piezoelectric elements come in contact with ground on which a pressure is exerted . And due to the pressure variation it generates an alternating voltage. Next instant another piezoelectric element come in contact with ground and it also generates a similar alternating voltage. 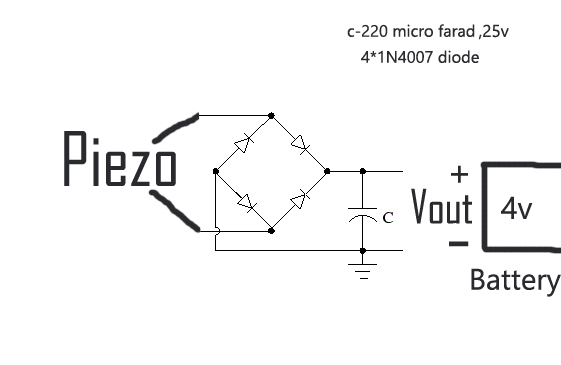 When vehicle moves fast all of piezoelectric elements come in contact with ground and all of them generate alternating voltage,then it is conducted through the RIm of tyre and passed through the bridge rectifier circuit to converting the AC component to DC .This power is utilized for the charging the battery in vehicles. By this energy harvesting we are making a attractive map guide for the cyclist with a Esp-01 micro controller. 1.The surface area of the tyre. so we should take care of that. I hope that,it is a reliable and continuous source of energy for the moving vehicle is guaranteed. Just concept of energy harvesting from the bicycle tyres. 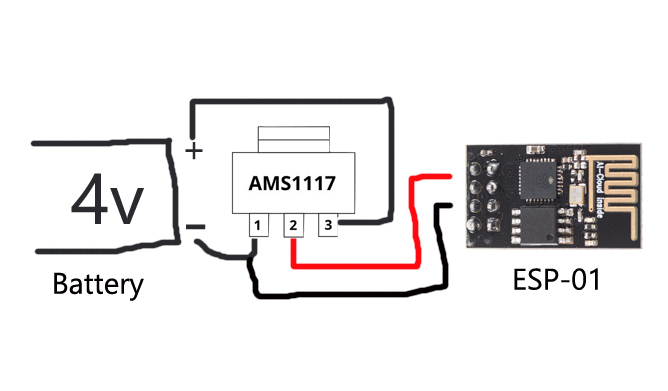 The circuit in which,the microcontroller get proper power! I have installed the piezos on the wheel with the help of the Double sided sticker! 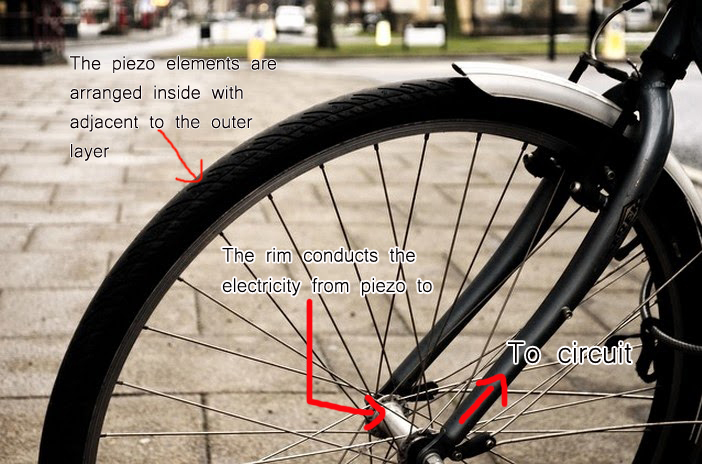 Otherwise, the piezo elements will be broken due to the heavy force by the wheel on the piezos. Here the piezo elements produce AC, So we want to rectify that. So I made a bridge rectifier for the rectification process using the four 1n4007 diodes. We know that rectifiers are used to convert AC to DC, but not a pure DC. There would be considerable AC component in their output, called ‘ripple’, in addition to the desired d.c. component. Most sophisticated electronic systems need pure DC supply to drive, or power them. To construct a good power supply which gives pure DC output, we need to remove or filter out the AC component from the output of rectifiers. As a filter I used 220 micro farad, 25 volt electrolytic capacitor. I have bought Ten piezo elements from the store for cheap.They are arranged in the series for hooking up in to the tyre. A functionnal harvester able to collect wasted EM wave’s energy and transform it into electricity to supply various ultra-low power sensors. You are about to report the project "PiezoElectric Energy", please tell us the reason.